The University of Antwerp (UA) is characterised by its high standards in education, internationally competitive research and entrepreneurial approach. It was founded in 2003 after the merger of the three universities that were previously known as RUCA, UFSIA and UIA, the university's roots go back to 1852. 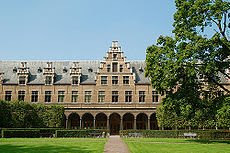 The University of Antwerp has approximately 11.000 students, which makes it the third largest university in Flanders. Over 1.000 of these students - exchange students not included - are from foreign countries, with a majority of EU countries. It was founded in 2003 after the merger of the three universities that were previously known as RUCA (State University Centre Antwerp), UFSIA (University Faculties Saint Ignatius Antwerp) and UIA (University Institution Antwerp). Hence, the university's roots go back to 1852. The University of Antwerp has approximately 15.000 students and 850 staff members, which makes it the third largest university in Flanders (= one of the 3 part of Belgium). Over 1.000 of these students (exchange students not included) are from foreign countries, with a majority of EU countries. In order to face the challenges posed by the internationalization of European education and research, the University is part of the Antwerp University Association (AUHA). The quality of education in Flanders is outstanding. Antwerp has had the opportunity to keep abreast of new educational developments through its curriculum reform and educational innovation programme. Teaching and learning at the 7 faculties, 16 institutes and many different centres is student-centred and competency-based, with an individual approach in which students are stimulated to develop into independently minded people who are capable of thinking analytically. Several excellent Institutes and Centres provide a wealth of internationally-oriented programmes. The University of Antwerp has 7 faculties in Applied Economics , Arts and Philosophy , Law, Medicine , Pharmaceutical, Biomedical and Veterinary Sciences , Political and Social Sciences and Sciences. The Institute of Development Policy and Management (IOB), the University of Antwerp Management School (UAMS) and the Institute of Transport and Maritime Management Antwerp (ITMMA) have an autonomous, faculty-like UA status. Doctoral programmes are available in most faculties. The 4 campuses are situated in the historic city centre and in the green belt to the south of the city.